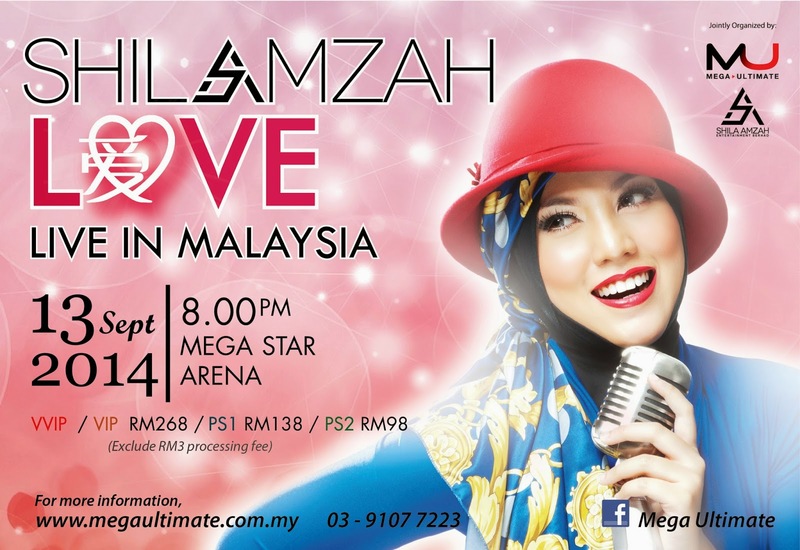 Exclusively brought to you by Mega Ultimate Sdn Bhd and Shila Amzah Entertainment Berhad, Shila Amzah <Love> Live in Malaysia will be held at Mega Star Arena on 13th September 2014 (Saturday). In conjunction with Shila Azmah <Love> Concert in Malaysia 2014, Shila Amzah is coming back to Malaysia on 19th July 2014 for her fans meeting and autograph session at 4:30pm, Paradigm Mall despite her busy schedule. There will be an exclusive ticket counter for the public at Upper Atrium, Level UG. An exclusive concert poster will be given away to each customer, and stand a chance to get her signature on stage. Shila Amzah <Love> Concert in Malaysia 2014 is jointly organize by Mega Ultimate Sdn Bhd and Shila Amzah Entertainment Berhad, Mega Star Arena as the Official Concert Venue，My FM & Era FM as Official Radio Station, Warner Music Malaysia as Official Recording Label, Paradigm Mall as Official Mall, Premiere Hotel as Official Hotel, Airasia as Official Airline，Alexandre Christieas Official Watch, Special Thank ESS.